This book grows on you, so if you don’t think it is your thing when you start to read, give it time and you won't regret it. The story starts off slow but then picks up pace until at the end it is at fever pitch. As a result, it took me far longer to read SLINGSHOT than it deserved but by half-way it had me hooked. 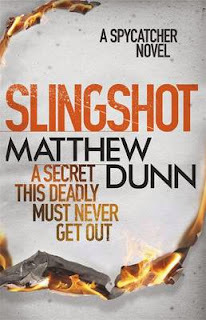 Well written and by a former MI6 spy officer, SLINGSHOT is a classic spy thriller, full of authenticity and with the perfect balance between scene description and action. There is also an extremely useful glossary at the back of the book that not only gives the full meaning of specific terms and acronyms but also explains a little bit about them. A Russian defector has a deadly secret, drawn up by top-level Russian and US army generals twenty years ago, and wants to tell the world what he knows. The secret is so dangerous that the paper the man carries, as well as the man himself, is wanted by just about everyone – MI6, CIA not to mention a Russian spy team, SVR. Cochrane is heading up an MI6/CIA team and they are well positioned to intercept the defector. However, he and his secret are stolen from under their noses just as he gets within their grasp. Cochrane becomes involved in a deadly game of hide-and-seek as he attempts to track down the defector and his kidnappers before the secret falls into the wrong hands. If you like highly charged, well written and authentic spy fiction then you are going to love this book! SLINGSHOT is the third in a series that features the highly skilled master spy Will Cochraine. If, like me, this is your first look at a book by this author, then it is probably going to be well worth you reading his earlier books as well!